Home » Service Manual Catalog » EPSON Adjustment Programs » InkJet printers » AP_L1300 I have paid for Reset Key but not received yet. Epson BX630FW, BX635FWD Ver.1.0.2 Service Adjustment Program New! 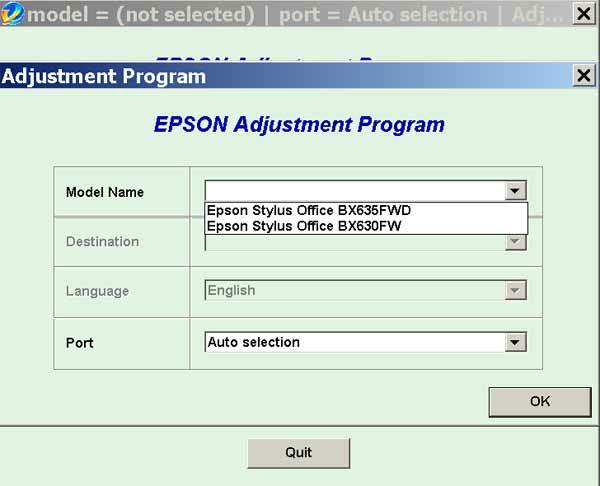 The Epson Adjustment Program for New models Epson BX630FW, BX635FWD can be used under Windows only (Millenium, 2000, XP, Vista, 7, 8, 10 [in compatibility mode]). We recommend reading the Epson BX630FW, BX635FWD Service Manual before using the adjustment utility. Have to confess I was a bit dubious about spending the money and whether it would be worthwhile, but am pleasantly surprised. Where others charge almost as much for a couple of single pages of info of little use, your manual is the complete one and indeed well worth the cost. Hoping it's going to enable my printer support guy to fully fix the problem with mine and save me having to shell out a LOT more to get another printer. Thanks. I woul like the info for reset a Epson R 280. Can i do it with your manual? Notify me of updates to Epson BX630FW, BX635FWD Ver.1.0.2 Service Adjustment Program New!